An effort is underway to collect 999 pairs of boots, sneakers and shoes throughout Oswego County from Nov 5th thru Dec 3rd. The footwear will be repaired and reconditioned before being delivered to the Rescue Mission in Syracuse. The shoes will be distributed to various charities throughout New York State to those in need. To participate a list of convenient drop off and collection stations is listed below. We hope to add locations as the campaign progresses and planning for next year gets underway. Mudd Murphy, former Mayor of Central Square and present Executive Director of the Oswego County Conference of Mayors, started the drive four years ago and coined it “Tithe My Shoes.” Ralph Rotella, owner of the Discount Shoe Repair shop in Syracuse, began collecting; cleaning and repairing used shoes in his spare time. He then donates them to the Rescue Mission for distribution. Ralph’s idea and hard work refurbishing shoes to help others have good warm footwear inspired Mudd to start the shoe collection campaign in Oswego County to help broaden Ralph’s goals. Last year the congregations from Central Square Community Church, Devine Mercy Roman Catholic Church, Mallory Weslyean Church, Victory Bible Church, along with the Village of Central Square and Assemblyman Will Barclay’s Office in Fulton collected 243 pairs of shoes, boots and sneakers and donated them to Ralph Rotello’s Discount Shoes Repair. Many people have asked if any of the footwear is recycled back into Oswego County. The answer is YES! The Rescue Mission store located at 57 E. Bridge St. Oswego NY will handle all local needs for shoes in Oswego County. This year Mudd hopes to reach a goal of collecting 999 pairs of shoes by December 3rd. This will allow Ralph time to refurbish the shoes and deliver them to the Rescue Mission by years end. Last year Rotella collected nearly 15,000 pairs of shoes for the Rescue Mission and he raises the bar every year. Mudd will start picking up donations on Dec 4th. 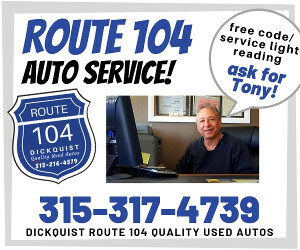 Please call (315) 952-2828 or email ([email protected]) if you have any questions or need help.